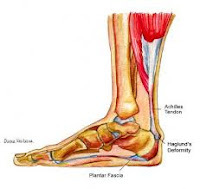 Everyone talks about pain in the bottom of their feet and that notorious word “plantar fasciitis” is everywhere on-line. But what if you’re experiencing pain in the back of your heel? Don’t assume it’s plantar fasciitis!! It may be Achilles tendinitis, where the Achilles gets inflamed at the insertion site at of the Achilles tendon at the heel bone. Both the achilles and plantar fascia attach to the calcaneus or heel bone. They do work together to help stabilize and support the foot. However, the conditions associated with each structure are very different. So a podiatrist can help you sort out which condition you have, achilles tendinitis or plantar fasciitis. Once the diagnosis is made a specific medical treatment plan will be tailored to your needs and activities. If you have either condition it is helpful to ice the area, decrease your activities and take anti-inflammatory medicine if you are not allergic. If you’re experiencing pain in the BACK of your heel and think you may have Achilles tendinitis, call Advanced Podiatry at 813-875-0555 for an appointment with one of our doctors so we can help you take action to resolve your heel pain today!